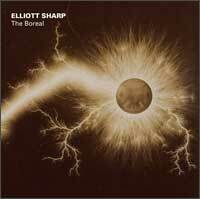 Elliott Sharp‘s output has been all over the map for quite some time. A Renaissance man, Sharp has recorded and performed jazz, blues, rock, and techno, as just a few examples. The Boreal, his most recent effort, focuses on chamber and orchestral music. Showcasing the talents of the JACK Quartet, pianist Jenny Lin, Orchestra Carbon (members of the JACK and Sirius quartets) and the Janacek Philharmonic Orchestra across four distinct suites, this release burns with a dark intensity. The title track leads off with JACK scraping and sawing their way through a modern classical piece. Equipped with metallic bows designed by Sharp, JACK provides a sweeping, echoing realization of fractured time and violently shifting tectonics. Not surprisingly, extended techniques abound. A standout piece is the fourth movement, which begins with a complex uptempo interplay, but ends with droning, crackling atmospherics. Oligosono features Lin on solo piano, and explore brooding, ominous themes. Lin percussively extracts Sharp’s compositions from her instrument, often attacking the strings themselves. But even when more conventional, this piece presents an fierce quality – the tension builds for long periods of time, then is sporadically released with rapid, knotty melodies. The Proof of Erdos, a tribute to idiosyncratic mathematician Paul Erdos, explores Sharp’s interests in complex patterns and structures. With some of Orchestra Carbon providing a dense wall of sound, the remaining strings explore variations of intricate themes. The organized chaos here often involves three or more overlapping themes played simultaneously. The Orchestra aptly evokes Sharp’s discordant hellscapes, as rumbling bass is overlaid with plucking and angular themes. On Corlear’s Hook rounds out the album with a full-blown orchestra. Different groups of instruments seem to operate at different speeds herein, from long drones to rapid motifs. Not unlike many avant-garde composers of the latter 20th century, Sharp explores densities and textures in addition to melodies and harmonies. As a consequence, this piece has a soundtrack quality – but one would be mistaken to write it off as mere background music. Instead, Sharp provides a full-blown realization of intricacies that fans of Xenakis, Boulez, and Ligeti will appreciate.